NEW insights into the life of one of Britain’s greatest composers have come to light with the discovery of reels of film intended for a documentary that was never finished. The colour film reels, dating back to the 1970s, contain unique interviews with family, friends and acquaintances of composer Gustav Holst (1874 – 1934), best-known for his orchestral suite The Planets. 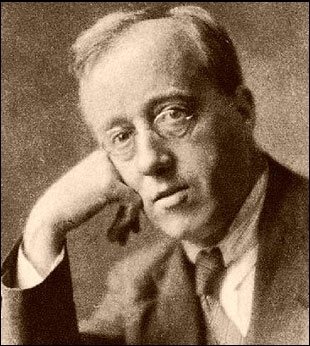 They were recorded for an unfinished film project on Holst’s life. The unique interviews, include reminiscences from Holst’s daughter Imogen and fellow composers Herbert Howells, Edmund Rubbra, and Sir Michael Tippett, were being stored at the The Holst Birthplace Museum, Cheltenham, until their recent discovery by producers at BBC Gloucestershire. They were made aware of the footage’s existence after receiving an e-mail from a member of the original production team from the 1970s. BBC Gloucestershire’s David Bailey, who helped unearth the archives, said: “It’s amazing to think that this footage has been hidden away all this time. Director of Music at Gloucester Cathedral, Adrian Partington, agrees that the films are important for shedding new light on the life of Holst. He said: “They are completely irreplaceable. They have so enriched my perception of what Holst was like as a man, and that in itself will enrich my perception of Holst as a composer because you can’t separate the two. According to a report on BBC News Gloucestershire about the discovery, the picture quality on some of the films has deteriorated with colours on the Eastman Colour II negative having faded after 30 years in storage. But it adds that the the footage is still “perfectly watchable” and that the “original audio tapes have survived the test of time much better”. The footage has now been digitized for use on the BBC’s website and also transferred to DVD, using one of the few remaining Steenbeck film editing machines at BBC Bristol. Each reel of film had to be matched up with the appropriate sound tape and the two synchronised together. The films could then be imported into modern digital video editing software. For the original BBC News report (23/07/09), click here. To see some of the fascinating interviews, click here. The original high resolution Moon landing tapes might still be missing, believed wiped, but NASA has unveiled the next best thing to getting them back. To commemorate the 40th anniversary of the historic Apollo 11 mission, the space agency has released an enhanced version of the television footage featuring Neil Armstrong and Buzz Aldrin taking one giant leap for mankind on the surface of another world. The digital restoration of the material has been done by Lowry Digital, a Burbank, California film restoration company that specialises in digitally restoring old feature films, including Casablanca, Moonraker and Star Wars. To obtain the best results, the firm sourced images from four copies of the TV broadcast, including one from the archives of American television network CBS. For those familiar with the fuzzy, grainy and indistinct Moon landing footage broadcast live on TV around the globe back in July 1969, the enhanced version will seem much improved with clear outlines of space suits and more details in the lunar surface. The restoration project is still on-going with an expected completion date of September, when more improved images will be released. But what of the original recordings of the live feed from the Moon? Among the many technological marvels of the Apollo 11 mission was a specially-designed magnetic tape lunar camera strapped to the side of the landing craft (“Eagle”) which recorded in a “slow scan” format that was vastly superior in quality to the images broadcast on TV. What an estimated 600 million viewers watched on their television screens at the time was essentially a copy of a copy, coming from a television camera pointed at the giant wall monitor at Houston mission control. Sadly, the tapes containing the original, pristine lunar feeds went missing from NASA many years ago, with agency officials now concluding that the priceless images were probably wiped over in the 1970s or ’80s when it was standard practice to reuse the 14-inch tape reels as a money-saving measure. For more on the enhanced Moon landing footage, read the Daily Telegraph’s story here. You can find out more about the loss of the original Moon landing tapes from the Guardian, here. Rare footage of mountaineer and explorer Sir Edmund Hillary ready to embark on his historic expedition to Antarctica has been saved from oblivion after being found in a loft. The black and white 16mm film was discovered in February in the loft of CB Norwood, a farm machinery company in Palmerston North, North Island, New Zealand, that had supplied tractors for the 1957 expedition. It shows Hillary, who in 1953 made history by conquering the peak of Mount Everest alongside sherpa Tenzing Norgay, being teased by team members for having a hair cut and the team leaving Christchurch, New Zealand, aboard the ship Endeavour bound for Antarctica. Hillary led the New Zealand section of a joint Commonwealth trans-Antarctic expedition, which became the first party to reach the South Pole since Robert Scott’s ill-fated expedition in 1912. The “rusty old can” containing the priceless film was found by CB Norwood staff member Paul Collins among junk destined for the rubbish tip. Curious, Collins took the film home to play on his projector. “It was magic, absolutely magic,” he told The Dominion Post. Company spokesman Rob Edwards said the film was nearly thrown away during the loft clear-out. Copies of the footage, said to be in perfect condition, have been donated to the Sir Edmund Hillary Alpine Centre at Aoraki/Mt Cook. It is the second new Hillary find that has recently come to light. The centre has also acquired a rare recording of an ABC Australia radio interview with Hillary in early August 1953, shortly after he conquered Everest. Bough from an estate in Sydney, and then sold by a New Zealand bookshop, it is understood to be the only copy in existence. Alpine centre general manager Denis Callesen was delighted to add the latest discoveries to the museum’s exhibits. “In the radio recording you can hear a young Sir Ed, who is obviously shy and unused to media attention, talking about his epic climb of Everest,” he told The Dominion Post.